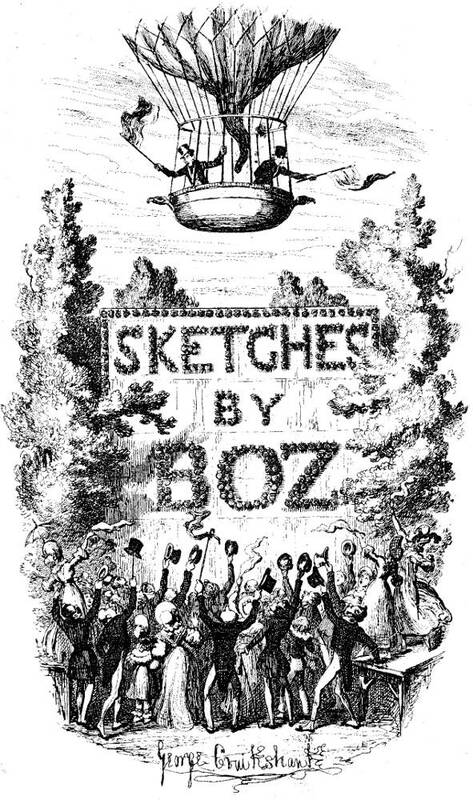 Sketches by Boz half-title vignette (November 1837 — June 1839). Between 1833 and 1836 Dickens's journalistic studies or "sketches" of London life seized the public's imagination, appearing in such periodicals as Bell's Life in London, The Morning Chronicle, and The Evening Chronicle before being anthologized, first by John Macrone in two volumes in February 1836, with sixteen illustrations by veteran caricaturist George Cruikshank. When the sketches were re-issued by Chapman and Hall in monthly parts, each instalment included two of Cruikshank's copper-plate engravings; however, the change in format from the Macrone two-volume duodecimo to the Chapman and Hall octavo required that Cruikshank re-engrave the entire series of illustrations for the monthly parts and the single-volume edition of 1839. Those illustrations, whether humorous or pathetic, did not merely constitute a "value-added" feature to the text; rather, they guided the reading of highly disparate material, providing a focal point (whether comic or tragic) for nearly half of the fifty-six pieces that now constitute Sketches by "Boz," Illustrative of Every-day Life and Every-day People. The character comedy, farce, immediacey, and topicality of the texts illustrated rendered them doubly popular with a broad readership, focussing the reader's attention on key moments in the forthcoming action and principal characters, shedding light in advance on characters' relationships and motivations, and signalling in the case of the short stories (under "Tales") important points in the plot. Dickens's fame, directly created by the runaway success of the Pickwick Papers, was augmented by the reification of his status as a best-selling author, observer, and humourist in John Macrone's two-volume set of Sketches by "Boz", published in early February 1836, a month ahead of the first serial number of Pickwick. Thus, in the spring of 1836 Dickens presented himself to the reading public as the writer of the disconnected Sketches as "Boz" (individual pieces anthologised) simultaneously with his picaresque satire of a "learned" society of amateurs whose misadventures would take them beyond the metropolis as episodes in a more connected narrative — a novel. Thus, he appeared in print by two different publishers as a combination of crusading journalist, social commentator, deft humourist, rollicking entertainer, trenchant satirist, and prolific novelist all within the space of two months early in 1836 — as 'Boz' rather than as Charles Dickens, the name he would claim for the title-pages of the three-volume edition of Oliver Twist. The first edition of the John Macrone, two-volume set of 1836 is illustrated throughout with just ten copper-plate engravings by George Cruikshank. Volumes I and II each have a frontispiece and seven subsequent illustrations, for a total of sixteen illustrations in the Macrone second edition (dated 1836, but in fact published in 1837). The Second Series has a frontispiece, engraved title-page, and eight subsequent illustrations. Thus, Cruikshank engraved a total of twenty-five illustrations before the monthly serialisation by Chapman and Hall, November 1837 through June 1839, a twenty-month project involving two illustrations for each monthly number. Although most of the sketches in this work were originally published as separate entries in various magazines and journals between 1833 and 1836, this edition does represent the first appearance of five of the sketches: "A Visit to Newgate," "The Black Veil," "The Great Winglebury Duel," "Our Next-Door Neighbours," and "The Drunkard's Death." In the half-title vignette for Sketches by Boz, Cruikshank and Dickens have depicted themselves as ascending in a hot-air balloon, an emblematic reflection of young Dickens's fast-rising popularity and Cruikshank's continuing to be the biggest name in contemporary book and periodical illustration — an indeed the forty illustrations that he completed for the Chapman and Hall re-publication of the Sketches constitute some of his finest work, realism conditioned by his own peculiar whimsy and grounded in his knowledge of the London streets and his accurate assessment of Dickens's characters. As the artist and writer wave Cross-of-St. George flags, reifying the bourgeois "Englishness" of their humour, rising aux Montgolfière above the heads of their urban well-wishers (a solidly upper-middle class assembly, fashionably dressed), the gentlemen raise their hats (one on a cane) while the ladies wave silk handkerchiefs. Although "Boz" appears in the centre, Cruikshank's over-sized signature dominates the bottom register, implying the mixed-media nature of the instalments, a formula with which Chapman and Hall had met astounding success both financial and critical in the monthly instalments of Pickwick. That the ascent is framed by English oaks rather than a cityscape may reflect the circumstances of the first hot-air balloon flight in 1783, since that epoch-making ascent began on the park-like grounds of the Chateau de la Muette on the western outskirts of Paris, although certainly one might argue that the scene could be set in Vauxhall Gardens, the sketch for which specifically mentions such a hot-air balloon. During the following year (1837) Macrone published a Second Series of the "Sketches" in one volume, uniform in size and character with its predecessors, and containing ten etchings by Cruikshank; for the second edition of this extra volume two additional illustrations were done, viz., "The Last Cab-Driver" and "May-day in the Evening." It was at this time that Dickens repurchased from Macrone the entire copyright of the "Sketches," and arranged with Chapman & Hall for a complete edition, to be issued in shilling monthly parts, octavo size, the first number appearing in November of that year. The completed work contained all the Cruikshank plates (except that entitled "The Free and Easy," which, for some unexplained reason, was cancelled) and the following [twelve] new subjects: "The Parish Engine," "The Broker's Man," "Our Next-door Neighbours," "Early Coaches," "Public Dinners," "The Gin-Shop," "Making a Night of It," "The Boarding-House," "The Tuggses at Ramsgate," "The Steam Excursion," "Mrs. Joseph Porter," and "Mr. Watkins Tottle." Cruikshank also produced a design for the pink wrapper enclosing each of the twenty monthly parts; this was engraved on wood by John Jackson, the original drawing (adapted from one the artist had previously made for Macrone) being now in the possession of Mr. William Wright, of Paris. The subject of the frontispiece is the same as that of the title-page in the Second Series. The alteration in the size of the illustrations for this cheap edition necessitated larger plates, so that the artist was compelled to re-etch his designs. These reproductions, although on an extended scale, were executed with even a greater degree of finish, and contain more "colour" than those in the first issue; but the general treatment of the smaller etchings is more pleasing by reason of the superior freedom of line therein displayed. As might be anticipated, a comparison of the two sets of illustrations discloses certain slight variations, which are especially noticeable in the following plates: "Greenwich Fair;" musicians and male dancer added on left. "Election for Beadle;" three more children belonging to Mr. Bung's family on right, and two more of Mr. Spruggins's family on left, thus making up the full complement in each case. "The First of May" (originally entitled "May-day in the Evening"); the drummer on the left, in the first edition, looks straight before him, while in the octavo edition he turns his face towards the girl with the parasol. "London Recreations;" in the larger design the small child on the right is stooping to reach a ball, which is not shown in the earlier plate. — Kitton, "George Cruikshank," Dickens and His Illustrators, p. 4. Dickens, Charles. "The Election for the Beadle." "Our Parish. "Sketches by Boz. Illustrated by George Cruikshank. London: Chapman and Hall, 1839, rpt. 1890. Dickens, Charles. "The Election for the Beadle." "Our Parish. "Sketches by Boz. Illustrated by Fred Barnard. The Household Edition. London: Chapman and Hall, 1876. Hammerton, J. A. "The Story of this Book." Charles Dickens's Sketches by Boz Illustrative of Every-day Life and Every-Day People. Illustrated by Harry Furniss. The Charles Dickens Library Edition. 18 vols. London: Educational Book, 1910. Vol. 1. Pp. i-v.